Currently in my apartment in Bristol frantically searching for a suitable mystery object whilst also trying to plan the talks I want to attend at SVP. I get the feeling skulls are getting boring for some of you, so perhaps it’s time I introduced an object that isn’t directly related to what I’m doing at work. In the pub yesterday, a natural history curator friend of mine (David Waterhouse from Norwich Castle Museum) queried the type of leather on the seat of his chair (it’s the kind of thing we do). We think we know, but can you work it out? Not an easy one, particularly without any clues, but I will attempt to answer any questions go help you on your way – just post them below in the comments section. Clearly that was too easy. What’s this mystery mess in an old cardboard box then? Are those spots the remnants of hair follicles? Not quite – see below! 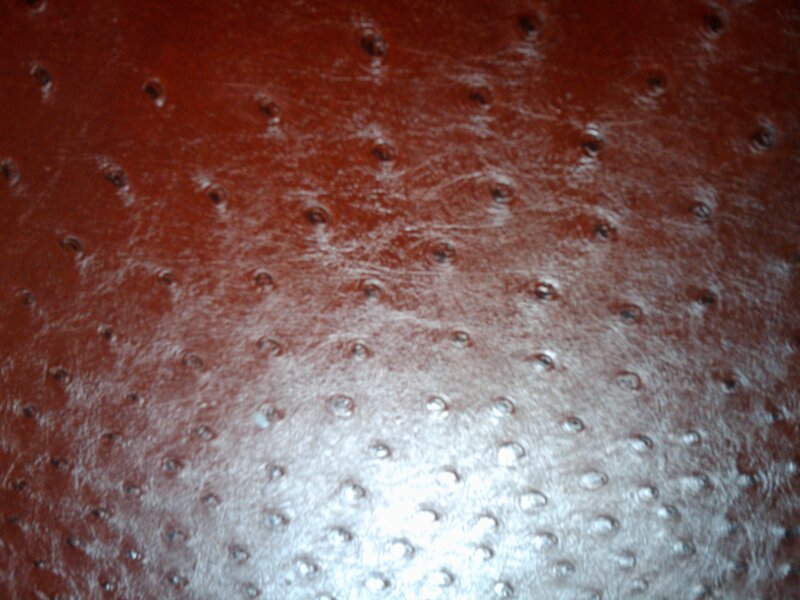 Quick search of the interwebs shows that ostrich leather does have quite strong patterning from the feather roots. And I can’t think of any other leathery animal that has feathers or hair so coarsely planted. Hmm, maybe this was easier than I thought. Perhaps I should put up a second object! Shouldn’t you be at some talks? Given your tropical experience, I assume you mean a fruitbat – in which case, no, but I can see why you might think that. I think that thing top right is a skull. Looks mammalian to me, and a herbivore. Skull looks like it’s about 10cm long. I’m wondering whether I should be making something of the bones next to the skull. Looks like a leg to me, but are they special in someway? A small member of the Cervidae, a White Tail Deer perhaps? It does however look like the contents of my kitchen bin though! 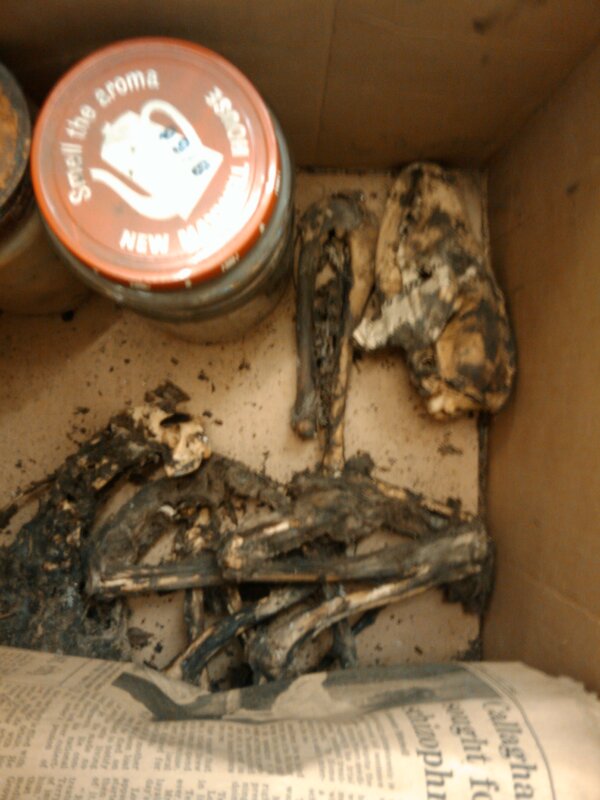 …OR, is the mystery why there are are some mangy old bones in a cardboard box? Or is this the usual manner by which you receive new specimens? Not quite the usual manner, but it happens… we’d say “no thanks” if something like this were to be offered to the Museum! I did think the curation of the remains was unusual. Do you think the coffee jar and newspaper are a clue? I think it is a fox skull and leg bones, and the skull still has the lower jaw attached. But I can’t see any canine teeth. I think the white bone almost in the middle might be the atlas. Thank you ! I didn’t know what the first one was though. I have told you before about leaving stuff to rot! Remember that time you had the owl in the bucket going down to bone but you forget to drill holes in the bottom and the farmer next door was fixing the fence and happened to look in it? I think this is one you hid in the back of the outhouse when you were at school. The owl had holes in the bucket and turned out pretty well, it was a squirrel that got waterlogged and was stumbled upon by Paul! Yes indeed, sorry, memory playing trcks. lol, I did the same, forgot to create good drainage on a Pipistrel bat (already dead I might add!) I was rendering. My mum found it as I put it rather too close to her bedroom window, and she started getting an odd smell in her room. Oops. Managed to do a really good bone render in the end, and a pickled one. Don’t even ask what I did with the chemistry set I got bought, I’m amazed at the chemicals they included, you’d never find them in a set these days!